The date is automatically set for the day you make the post—to change it to the date of the meeting, click on the "Published On" date, then select the day from the calendar. Use the Heading tags to organize your text with subheadings. When you have a list or a series of sentence fragments, consider using bullet points. 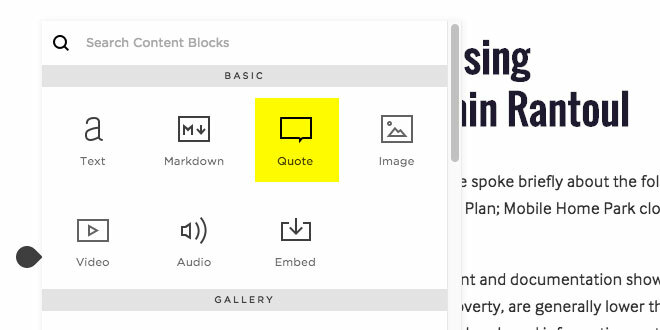 Choose the Quote Block and type the text you'd like to emphasize. When you're done, you can click and drag the quote block to a new position. To make an inset, click and drag the block to the left or right side of a paragraph until you see a small gray square. Dan gave an overview of the Planning and Zoning Maps. He spoke briefly about the following items: Redevelopment - using the current Comprehensive Plan; Mobile Home Park closures and the desire to infill properties to their highest and best use. Mike Loschen shared a Community-wide 5-year Assessment and documentation showing 51% low to moderate income. Mike said the income level for poverty, are generally lower than the 30% income level shown on the HUD income sheet. Mike also shared information on the Deferred Maintenance Program for single-family, owner occupied homes. It has helped many local homeowners. There is also a Rental Rehab Loan that comes with HUD regulations and restrictions, therefore not frequently used by Landlords. The question was asked, “How many non-owner-occupied single family units are in Rantoul?” Inspection Dept. will research and provide this information. Gary Crane reported that Real Estate Owned by Lenders and Foreclosures (REO) properties here in Rantoul are at 30%. Although this is down from the 40%, 30% is unheard of in the entire county! SUGGESTION: Alan Nudo suggested the Village, as a whole, provide an incentive for owner-occupied property. For example, provide funding to fix up the property and a method to pay back the loan through proceeds from the sale. The results will produce more owner occupied property and an increase in property taxes. SUGGESTION: Herman Fogal - Provide the homeowners with an Inspection and $500 Warranty. 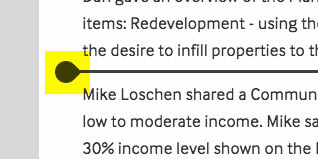 Suggest more Senior Housing, and Condos with zero lot lines. Problems with growth – neighborhoods are not willing to accept this and certain other developments in their backyard. Public perception of Rantoul School System is a big deterrent. Gary Crane said the median income for Rantoul is $72,000. He stated that Commercial and Industry could bring an increase to residential property. 3. Where do you see housing in Rantoul within the next 10 years? a) Filling in empty lots in existing subdivisions and b) Working with existing neighborhood homeowner associations to build new housing units within their development. 4. Where do you want to see housing in Rantoul after 10 years? Dan asked the group to think outside the box – Think about a Golf Course Community north of Rantoul. This could help the Park District, and we get new housing development. He would like less Mobile Home Parks in Rantoul. 30 years ago, there were 16, now down to 6. Mobile Home Parks are not cost effective to the growth of Rantoul. By Ordinance 2238, units older than 1976 can no longer be brought into the existing parks. Alan Nudo suggested the Committee Set a Goal - Identify the REO’s per year and focus on reducing them. Work with banks; Identify and market target groups. Find a “Grant” for funding. Look into Freddie Mac’s owner occupied purchase incentive. Also, invite a banker to join the Committee. Dan will invite Diane Michaels. Herman Fogal said we should offer this incentive – Tie in a pre-inspection into home sales. This will be good for the buyer and seller. Rantoul currently has 19 pending sales. Dan reminded him that budget issues must be addressed before performing additional inspections. All agreed that to be effective, incentives must include the 3 taxing bodies. Chief Farber shared this website: www.crimereports.com it is updated weekly.